She lived close to the center of power in China as the daughter-in-law of Chiang Kai-shek and she was the mother of four, but when she died in Taipei last month she was all alone. Faina Chiang, legitimate wife of Chiang Ching-kuo, lived a low key life. Many stories about the "legendary but hard life" of Faina Chiang -- Chiang Kai-shek's daughter-in-law and Chiang Ching-kuo's wife -- were retold after she died in Taipei at the age of 88 a month ago. The life of the quiet and reserved Russian-born woman, also known by her Chinese name, Chiang Fang-liang, is not well known in China and few know that she used to live in Shanghai in a white villa on Huaihai Road. Her residence was one of a group of eight Spanish villas at 1610 Huaihai Road and was called "Yi Cun." Faina Chiang and Chiang Ching-kuo's family lived in the No. 2 building facing Huaihai Road. Built in 1942, the brick-and-wood house looks simple and serene with only some patterns carved into the window frames. The sitting room was on the first floor while the bedroom, reading room and Chiang Ching-kuo's office were on the second. A lovely terrace led off from the second floor overlooking a small garden planted with camphor laurel trees and Chinese parasols. A small room at the side housed the police assigned to guard the family. Today, the villa belongs to a Taiwanese businessman. On August 10, 1948, Chiang Ching-kuo was sent by his father to take charge of government finances in Shanghai. Kuomintang officials arranged for him to move into the house with his family. " "Chiang Ching-kuo lived a simple life," says Huang Guoxin, an expert on architectural history and co-author of the book, "Famous People, Houses and Stories." "He usually got up at 6am, ran along the Linsen Road M. (now Huaihai Road M.) and he would have a traditional breakfast of Chinese congee. He also often went out by himself to buy fried twisted dough for breakfast." Born in 1910 in Chiang Kai-shek's hometown in neighboring Zhejiang Province, Chiang Ching-kuo was sent to Moscow to study at the age of 15 and he stayed there for 12 years. His mother was Chiang Kai-shek's first wife. (Chiang Kai-shek later married Soong Mei-ling, the youngest of the three famous Soong sisters but they had no children). While working in a Russian factory, young Chiang met and fell in love with Faina who was born in Siberia and they were married in 1935. According to Zhao Hong's book, "The Women in the Chiang Family,"
Chiang Kai-shek took a little time to get used to having a tall, blue-eyed daughter-in-law. But he found that she had a gentle, caring nature that met the standards set for a "good" Chinese wife and he gave her a Chinese name. She presented the Chiang family with three sons and one daughter who all grew to be tall and handsome-looking. The three sons are now dead and the daughter, Chiang Hsiao-chang, lives in the United States with her family. "Chiang Ching-kuo had been given a mission to control Shanghai's economy through a price-control policy but he ran into some local profiteering speculators," says Huang. "His policy failed after only three months. He found Shanghai was 'a society of profiteers and gangsters who had behind-the-scenes supporters'." Chiang must have wept tears of frustration when at home in "Yi Cun" which his wife had turned into a comfortable nest for the family. At home, she spoke the Ningbo dialect, cooked Ningbo food and gave birth to her fourth child. The family lived there for several months in 1948 and left Shanghai forever before the founding of the People's Republic of China in 1949. 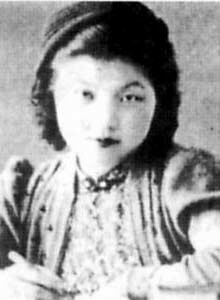 In contrast to her famous step-mother-in-law, Soong Mei-ling, Faina Chiang kept an extremely low profile during her years in Taipei. She was only seen in public when meeting her husband at the airport on his return from an overseas trip or when she went with him to vote. She quit playing mah-jong and golf because her husband didn't like her playing the games. From Siberia to Moscow to Shanghai and from Shanghai to Taipei, Faina Chiang was at the center of political power but she was never interested in politics and wanted only to concentrate on looking after her family. She was alone in her last years. Chiang Ching-kuo died in 1988 and her three sons in 1989, 1991 and 1996. The successive deaths of her sons aggravated her already frail health. It was said she was the loneliest woman in Taipei. She had no real friends and no descendants close to her. Her closest relatives all lived overseas and even after her death, her only daughter was unable to attend the funeral because she herself was seriously ill.
Chang Hsiao-tzu and Chang Hsiao-yen. Chang Hsiao-yen later became a senior official in Taiwan and he has traveled to Zhejiang Province to Chiang Kai-shek's hometown to pay respect to his ancestors. 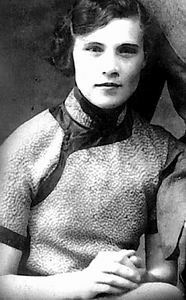 "Legendary but hard" are the words used to describe Faina Chiang's life and it's easy to type them out but only the firm, gentle and enduring woman from Siberia would know the pain and bitterness that lies behind them.